ANET is working with the Karen community to develop a set of initiatives that would lead to self-sustaining livelihood opportunities while helping restore cultural connections and generate positive environmental outcomes. Our interest is in conceptualizing and developing initiatives that are suited to the community's own strengths and are in accordance with its existing worldviews and cultural norms. In 2015, the Andaman Karen Crafts Co-operative Society (AKC) and Women's Centre was formed as a registered society. With support from ANET, one of the key activities of AKC has been the building of a community centre in Webi which has been constructed with generous support from Seacology. This centre is expected to act as the starting point for a holistic programme to revitalise the community. Funded by the Department of Science and Technology's 'SEED' program, Government of India, Dr. Manish Chandi leads a project on restoration and technological intervention in the southern Nicobar Islands. Facilitated by WWF India’s Sustainable Livelihoods Program, the project seeks to restore two species of native flora, Nypa fruiticans and Pandanus leram that were devastated during the tsunami of 2004. The indigenous Nicobarese of the region depended on these two natural resources for customary roofing of traditional houses (Nypa) and as a traditional source of nutrition and food (Pandanus). The islanders in coordination with the Tribal Council of Great and Little Nicobar Islands are restoring these two species in their villages by regeneration. Simple household technologies to diversify utility and add economic value to coconut toddy, a local product, by processing it into organic coconut vinegar and coconut syrup are also being introduced. A simple hydraulic press to extract virgin coconut oil designed by the late Dr. Rauf Ali for the Nicobar Islanders is also being introduced to the islander community of the region. ​The Andaman and Nicobar Islands have rich terrestrial and marine resources that support a range of natural resource based practices across the length of the islands. Recent settlers and migrants from different parts of mainland India have greatly increased the diversity of fishing and farming communities and complexity of social and economic systems in these islands. Anupama Ramakrishnan has been studying identity politics in North Andamans as part of her PhD dissertation at the University of Delhi guided by Dr. Sudha Vasan. Her study finds that resource politics in the Andaman Islands is expressed through identity assertions by migrant groups. Groups that have a longer history of settlement in the islands claim their right over the islands’ resources and accuse later, more recent migrants of unsustainable exploitation of social and natural resources. These political struggles over resource access have only intensified in the context of the neoliberal turn of the state and economy. Through an ethnographic exploration of the resource and identity politics of one such group—descendents of Bengali-speaking, agrarian, refugee settlers in North Andaman, also known as ‘Bharti Family’—she investigates the ways in which people in the Andaman Islands make cultural and practical sense of their land, natural resources and environment. The islands are characterized by multi-faceted fisheries, and fisheries governance needs to be tailored to balance the diversity of communities, ecosystems and fishing practices. The oldest commercial fisheries for shellfish and bêche-de-mer catered solely to foreign markets and even today, a significant proportion of the landed fish catch is exported to Southeast Asia. The enthusiastic promotion of newer technologies such as the live fish trade and tuna long lining and the unchecked growth of specialized fisheries like that for grouper, threaten to dominate most of the islands’ fisheries. Dakshin Foundation in collaboration with ANET has created the first detailed profile of fisheries in the Andaman and Nicobar Islands. This includes information on fishing communities, their practices, mechanisms of fisheries governance such as the operation of markets, subsidies in fisheries, implementation of regulations and management approaches for sustainable fisheries development. Additional projects at Dakshin, lead by Sahir Advani have aimed at understanding the evolution of commercial fisheries and commodity chains in the Andaman and Nicobar Islands with a special focus on the high value dollar grouper (Plectropomus leopardus) fishery. Currently Sahir Advani is pursuing a PhD at University of British Columbia and his research focuses on the effect of differing cultural and historical origins on the valuation of fish resources and marine ecosystems by fishing communities. Export fisheries have driven marine resource extraction in the Andaman Islands, leading to classic boom-bust scenarios like in the case of ornamental shellfish like Trochus and Turbo. An understanding of the social and economic drivers of fisheries in the past can help inform future management and sustainable development strategies. With this in mind, ANET Fellow, Dr. Madhuri Ramesh, aims to trace the shifting status of the Trochus snail (also known as the Top shell or Tecturus niloticus) in the Andaman Islands to identify how changing categorizations privilege certain actors and their concerns at the expense of others and the consequences for marine resources and island communities. This project will help improve our understanding of how ecology and economy articulate with each other in the marine space. The success of a Marine Protected Area (MPA) depends on the cooperation of the local community. Knowing the perception of people is important to understand their attitudes towards any conservation policy or actions. Perceptions are influenced by many factors including their dependence on the park resources, their socio-economic status and how the park influences their livelihoods. Recently, Madhuri Mondal from Tata Institute of Social Sciences, completed her Master's Thesis dissertation work at ANET, aiming to assess the level of resource use and dependence in and around Mahatma Gandhi Marine National Park (MGMNP) and to determine the perceptions of local communities towards the park. 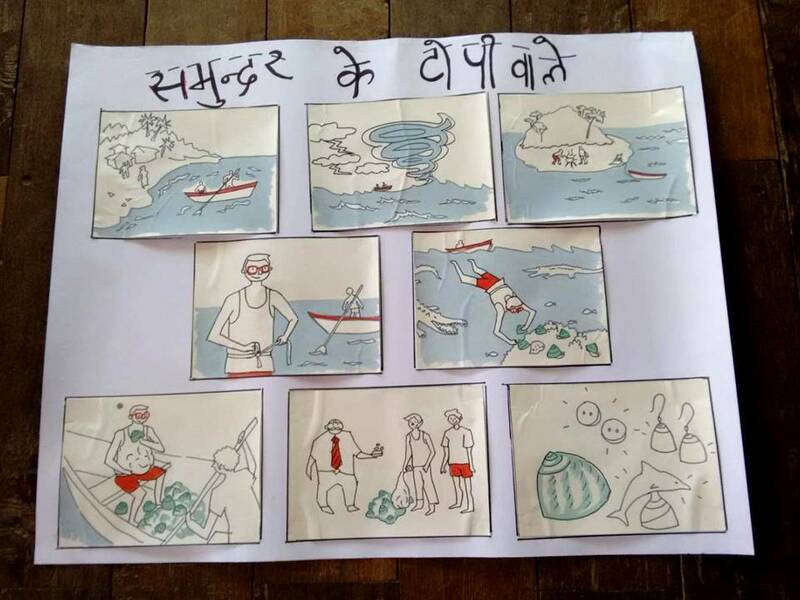 Along similar lines, Dakshin Foundation in collaboration with WWF India is currently initiating a project to study community perceptions in relation to MPAs across the archipelago.